Robi brings 2 GB internet package only 129 taka with 1 GB WhatsApp offer. Robi prepaid customer are uses this offer. Validity of 7 days. 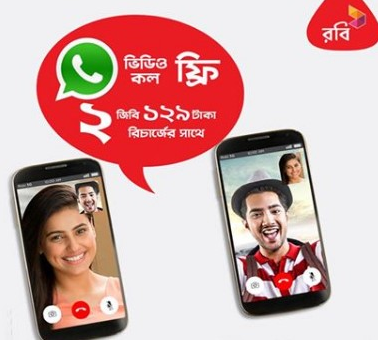 Robi users will now get 2GB and an additional 1 GB WhatsApp to speak with their friends. Robi 2GB internet 129 tk internet package with with 1 GB free WhatsApp. This offer uses 24 hours. To check balance data dial *123*3*5#. Data volume 2G and 3G network environment.